In me boating experience I've owned old two stroke engines and 2007 and newer fourstrokes. This weekend i'm going to look at a older Silver Streak welded aluminum runabout with a 2001 Yamaha Four Stroke 115hp main engine. I have no experience with older four strokes but have heard many stories of people being warry of them and of course when a fourstroke engine needs work it will cost a lot more then a two stroke. What should i be looking for in an older engine? obviously compression is the first place to start plus leg and engine oil. Any other advice? thanks for the response. Unfortunatly the owner of the boat emailed me last night to tell me that he's decided not to sell the boat afterall. Pretty unfortunate. I'll go back to trolling craigslist for the right boat! As for 2stroke vs 4 stroke. I just think that since theres about half as many moving parts in a two stroke it is a cheaper maintinence motor. Also more user friendly for a home mechanic in my opinion. A modern 4 Stroke engine will be around for at least 4000 hours if not longer. Maintained properly she will be there far longer than you will own the boat. I would be looking for a 4 stroke not a 2 Stroke. Better Fuel economy. No expensive Oil to buy besides the crank case oil. Do your own maintenance and press on. and i do agree with you. I'm looking for a 4 stroke engine. what i meant by that comment was being warry of a older fourstroke that might not have been maintained propperly. I like the evinrude etec direct injected 2 strokes. they are different from the old 2-strokes, more fuel efficient and require very little maintenance. So don't walk away from a good boat with a modern etec. I love the new etecs too! 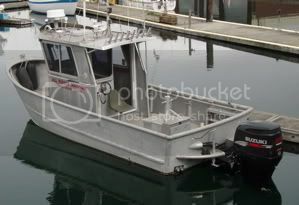 in fact just got back from fishing on my bosses 17' aluminum with a 90hp etec! really i'll buy whatever comes along at this point! I'm just ready for a boat of my own again!